The 1.0 TOG Sleeping Bag is designed for Autumn / Spring temperatures but can be used all year round. 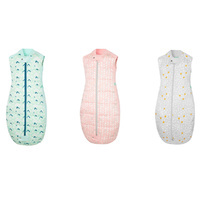 The ergoPouch sleeping bags have a 5 star safety rating and will help your little one stay at a regulated temperature which will help them sleep better. The ergoPouch range was designed by a mum whose baby failed sleep school. So the ultimate sleep range was created to ensure her baby had the best possible chance to get a good nights sleep. I honestly believe this is the best you can buy for your baby. Developed with stretch inserts on the shoulders and sides. 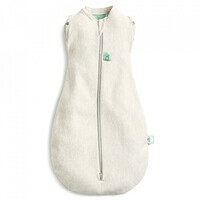 Fits snugly allowing your baby to move freely without getting tangled and upset. Stays 2 - 3 degrees cooler in hot weather and warmer in cold. Your baby will spend most of their life in bed, they deserve the best in ultimate comfort, warmth and safety. 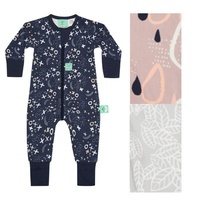 With ergoPouch's innovative range of organic baby sleeping bags and swaddles, they are proud to provide high quality garments made from natural fibres to help babies sleep better. Sleeping with natural fibres, such as alpaca and bamboo, has long been known to give a better night's sleep, and now we know why. Natural fibres disperse moisture from the skin, providing an even warmth and body temperature. Studies have consistently confirmed that sleeping comfort is highly dependent upon the body achieving its own unique optimal temperature balance for a restful and revitalising night's sleep. If during the natural sleeping cycle, the body is too warm or too cold, the human body will either consciously or subconsciously adjust its position in bed, thereby causing a disruption to the natural sleep cycle.